Inspired by the best-selling The Boys' Book, Boys Only is an illustrated graphic-novel-style handbook for boys with a sense of adventure. 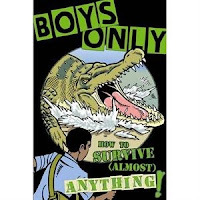 From how to avoid escape from quicksand to how to survive being blasted into space, and from what to do when you are lost in the desert to how to beat your friends in a trial of strength, there's hours of fun for boys to enjoy. If my memory serves me well (and most of the time it does) there has already been a book with this title. The difference with this edition is that this one is in a graphic novel format, a perfect presentation for this fun and action filled title. At first glance it’s difficult to tell if this book is serious or not. The contents page lists chapters such as How To Treat a Broken Leg and How to Survive an Earthquake, but if you look closer there are also chapters on How to Survive a Zombie Attack and How to Survive a T-Rex, so maybe, there’s a little bit of fun thrown in with the serious stuff! There is a disclaimer at the front of the book, saying all of the right things about not putting yourself in danger on purpose, using care with heat and sharp objects, use safety gear, stay within the law, be considerate of others and always ask the assistance or advice of an adult whenever necessary. Before we even start with the How to Survive a…. there’s an Are You Ready? Page which lists what you should have in a survival ‘pocket pack’ (compass, needle and thread, mirror, small first aid kit etc) and also a survival ‘backpack’ (torch, water, change of clothes, waterproofs, radio, sunscreen, signalling device etc). All good sound advice. Shark Attack: If you do spot a shark fin above the water, swim back to the beach as calmly as possible. Crocodile Attack: If you're dragged into the water, stick your hand inside its mouth and open it's palatal valve so that water gets in - it's your only chance. Vampire Attack: If you're unlucky enough to encounter vampires after dark, persuade them to meet you in the morning - at sunrise they are weak and direct sunlight burns their skin too. There's also a step by step guide on how to turn your trousers into a flotation device if you find yourself lost at sea with no life jacket! Now that I did think was pretty cool. 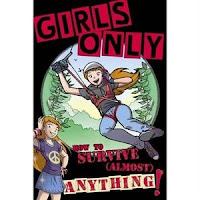 There is also a girls edition, which I didn’t read cover to cover, but it includes chapters on, How to Survive a BFF Fight, How To Survive Shyness, How to Pick the Perfect Sunglasses, as well as the all important Surviving a Zombie Attack!